Susette Kelo, et al. v. City of New London, Connecticut, et al. The governmental taking of property from one private owner to give to another in furtherance of economic development constitutes a permissible "public use" under the Fifth Amendment. Supreme Court of Connecticut decision affirmed. Kelo v. City of New London, 545 U.S. 469 (2005), was a case decided by the Supreme Court of the United States involving the use of eminent domain to transfer land from one private owner to another private owner to further economic development. In a 5–4 decision, the Court held that the general benefits a community enjoyed from economic growth qualified private redevelopment plans as a permissible "public use" under the Takings Clause of the Fifth Amendment. The case arose in the context of condemnation by the city of New London, Connecticut, of privately owned real property, so that it could be used as part of a “comprehensive redevelopment plan.” However, the private developer was unable to obtain financing and abandoned the redevelopment project, leaving the land as an undeveloped empty lot. This case was appealed to the Supreme Court of the United States from a decision by the Supreme Court of Connecticut in favor of the City of New London. The owners, including lead plaintiff Susette Kelo of 8 East Street, sued the city in Connecticut courts, arguing that the city had misused its eminent domain power. The power of eminent domain is limited by the Takings Clause of the Fifth Amendment and the Due Process Clause of the Fourteenth Amendment. The Takings Clause reads: "...nor shall private property be taken for public use, without just compensation.” Under the Due Process Clause of the Fourteenth Amendment, this limitation also applies to the actions of state and local governments. The plaintiffs argued that economic development, the stated purpose of the taking and subsequent transfer of land to the New London Development Corporation, did not qualify as a public use under the Fifth Amendment. The Connecticut Supreme Court heard arguments on December 2, 2002. The state court issued its decision (268 Conn. 1, SC16742) on March 9, 2004, siding with the city in a 4–3 decision, with the majority opinion authored by Justice Flemming L. Norcott, Jr., joined by Justices David M. Borden, Richard N. Palmer and Christine Vertefeuille. Justice Peter T. Zarella wrote the dissent, joined by Chief Justice William J. Sullivan and Justice Joette Katz. The State Supreme Court held that the use of eminent domain for economic development did not violate the public use clauses of the state and federal constitutions. The court held that if a legislative body has found that an economic project will create new jobs, increase tax and other city revenues, and revitalize a depressed urban area (even if that area is not blighted), then the project serves a public purpose, which qualifies as a public use. The court also ruled that the government’s delegation of its eminent domain power to a private entity was constitutional under the Connecticut Constitution. The United States Supreme Court granted certiorari to consider questions raised in Berman v. Parker, 348 U.S. 26 (1954) and later in Hawaii Housing Authority v. Midkiff, 467 U.S. 229 (1984). Namely, whether a "public purpose" constitutes a "public use" for purposes of the Fifth Amendment's Taking Clause: "nor shall private property be taken for public use, without just compensation." Specifically, does the Fifth Amendment, applicable to the states through the Due Process Clause of the Fourteenth Amendment (see main article: Incorporation of the Bill of Rights), protect landowners from takings for economic development, rather than, as in Berman, for the elimination of slums and blight? Kelo was the first major eminent domain case heard at the Supreme Court since 1984. In that time, states and municipalities had slowly extended their use of eminent domain, frequently to include economic development purposes. In the Kelo case, Connecticut had a statute allowing eminent domain for “economic development” even in the absence of blight. There was also an additional twist in that the development corporation was ostensibly a private entity; thus the plaintiffs argued that it was not constitutional for the government to take private property from one individual or corporation and give it to another, if the government was simply doing so because the repossession would put the property to a use that would generate higher tax revenue. Kelo became the focus of vigorous discussion and attracted numerous supporters on both sides. Some 40 amicus curiae briefs were filed in the case, 25 on behalf of the petitioners. Susette Kelo's supporters ranged from the libertarian Institute for Justice (the lead attorneys on the case) to the NAACP, AARP, the late Martin Luther King's Southern Christian Leadership Conference and South Jersey Legal Services. The latter groups signed an amicus brief arguing that eminent domain has often been used against politically weak communities with high concentrations of minorities and elderly. The case was argued on February 22, 2005. Oral arguments were presented on behalf of the petitioners (plaintiffs) by Scott G. Bullock of the Institute for Justice in Washington D.C. and on behalf of the respondents (defendants) by Wesley W. Horton of Horton, Shields & Knox in Hartford, CT. The case was heard by only seven members of the court with Associate Justice Sandra Day O'Connor presiding, as Chief Justice William Rehnquist was recuperating from medical treatment at home and Associate Justice John Paul Stevens was delayed on his return to Washington from Florida; both absent Justices read the briefs and oral argument transcripts and participated in the case decision. During arguments, several of the Justices asked questions that forecast their ultimate positions on the case. Justice Antonin Scalia, for example, suggested that a ruling in favor of the city would destroy "the distinction between private use and public use," asserting that a private use which provided merely incidental benefits to the state was "not enough to justify use of the condemnation power." On June 23, 2005, the Supreme Court, in a 5–4 decision, ruled in favor of the City of New London. Justice Stevens wrote the majority opinion, joined by Justices Anthony Kennedy, David Souter, Ruth Bader Ginsburg and Stephen Breyer. Justice Kennedy wrote a concurring opinion setting out a more detailed standard for judicial review of economic development takings than that found in Stevens's majority opinion. In so doing, Justice Kennedy contributed to the Court's trend of turning minimum scrutiny—the idea that government policy need only bear a rational relation to a legitimate government purpose—into a fact-based test. In Romer v. Evans, 517 U.S. 620, 633 (1996), the Court said that the government purpose must be "independent and legitimate." And in United States v. Virginia, 518 U.S. 515, 533 (1996), the Court said the government purpose "must be genuine, not hypothesized or invented post hoc in response to litigation." Thus, the Court made it clear that, in the scrutiny regime established in West Coast Hotel v. Parrish, 300 U.S. 379 (1937), government purpose is a question of fact for the trier of fact. [2.] and in that regard, only of incidental benefit to the city...'"
Kelo v. City of New London did not establish entirely new law concerning eminent domain. Although the decision was controversial, it was not the first time “public use” had been interpreted by the Supreme Court as “public purpose”. In the majority opinion, Justice Stevens wrote the "Court long ago rejected any literal requirement that condemned property be put into use for the general public" (545 U.S. 469). Thus precedent played an important role in the 5–4 decision of the Supreme Court. The Fifth Amendment was interpreted the same way as in Midkiff (467 U.S. 229) and other earlier eminent domain cases. O'Connor argued that the decision eliminates "any distinction between private and public use of property — and thereby effectively delete[s] the words 'for public use' from the Takings Clause of the Fifth Amendment." Something has gone seriously awry with this Court's interpretation of the Constitution. Though citizens are safe from the government in their homes, the homes themselves are not. 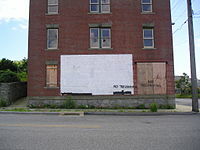 One of the few remaining houses in the Fort Trumbull neighborhood, September 1, 2006. Underneath the white paint can just barely be read the words "Thank you Gov. Rell for your support" and the web URLs of two organizations protesting over-use of eminent domain, Castle Coalition and Institute for Justice. The same house, June 10, 2007. The "thank you" is still visible, but some windows are broken and others are boarded up, and "No Trespassing" has been spray-painted on it, as well as the URLs being obscured by spray paint. Following the decision, many of the plaintiffs expressed an intent to find other means by which they could continue contesting the seizure of their homes. Soon after the decision, city officials announced plans to charge the residents of the homes for back rent for the five years since condemnation procedures began. The city contended that the residents have been on city property for those five years and owe tens of thousands of dollars of rent. In June 2006, Governor M. Jodi Rell intervened with New London city officials, proposing the homeowners involved in the suit be deeded property in the Fort Trumbull neighborhood so they may retain their homes. A group of New London residents formed a local political party, One New London, to combat the takings. The controversy was eventually settled when the city paid substantial additional compensation to the homeowners and agreed to move Kelo’s home to a new location. The land was never deeded back to the original homeowners, most of whom have left New London for nearby communities. Three years after the Supreme Court case was decided, the Kelo house was dedicated after being relocated to 36 Franklin Street, a site close to downtown New London. Susette Kelo, however, has moved to a different part of Connecticut. In spite of repeated efforts, the redeveloper (who stood to get a 91-acre (370,000 m2) waterfront tract of land for $1 per year) was unable to obtain financing, and the redevelopment project was abandoned. As of the beginning of 2010, the original Kelo property was a vacant lot, generating no tax revenue for the city. In the aftermath of 2011's Hurricane Irene, the now-closed New London redevelopment area was turned into a dump for storm debris such as tree branches and other vegetation. Pfizer, whose employees were supposed to be the clientele of the Fort Trumbull redevelopment project, completed its merger with Wyeth, resulting in a consolidation of research facilities of the two companies. Pfizer chose to retain the Groton campus on the east side of the Thames River, closing its New London facility in late 2010 with a loss of over 1,000 jobs. That coincided with the expiration of tax breaks on the New London site that would have increased Pfizer's property tax bill by almost 400 percent. The well-laid plans of redevelopers, however, did not pan out. The land where Susette Kelo's little pink house once stood remains undeveloped. The proposed hotel-retail-condo "urban village" has not been built. And earlier this month, Pfizer Inc. announced that it is closing the $350 million research center in New London that was the anchor for the New London redevelopment plan, and will be relocating some 1,500 jobs. "They stole our home for economic development," ousted homeowner Michael Cristofaro told the New York Times. "It was all for Pfizer, and now they get up and walk away." The final cost to the city and state for the purchase and bulldozing of the formerly privately held property was $78 million. The promised 3,169 new jobs and $1.2 million a year in tax revenues had not materialized. As of 2018 the area remains an empty lot. Public reaction to the decision was highly unfavorable. Much of the public viewed the outcome as a gross violation of property rights and as a misinterpretation of the Fifth Amendment, the consequence of which would be to benefit large corporations at the expense of individual homeowners and local communities. Some in the legal profession construed the public's outrage as being directed not at the interpretation of legal principles involved in the case, but at the broad moral principles of the general outcome. Federal appeals court judge Richard Posner wrote that the political response to Kelo is "evidence of [the decision's] pragmatic soundness." Judicial action would be unnecessary, Posner suggested, because the political process could take care of the problem." Opposition to the ruling was widespread, coming from groups such as AARP, the NAACP, the Libertarian Party and the Institute for Justice. Many owners of family farms also disapproved of the ruling, as they saw it as an avenue by which cities could seize their land for private developments. The American Conservative Union condemned the decision. As a result, many states changed their eminent domain laws. Prior to the Kelo decision, only seven states specifically prohibited the use of eminent domain for economic development except to eliminate blight. Since the decision, forty-four states have amended their eminent domain laws, although some of these changes are cosmetic. The New York Times editorial board agreed with the ruling, calling it "a welcome vindication of cities' ability to act in the public interest." The Washington Post's editorial board also agreed with the ruling, writing, "... the court's decision was correct... New London's plan, whatever its flaws, is intended to help develop a city that has been in economic decline for many years." The Kelo fiasco eventually cost the taxpayers tens of millions of dollars, with nothing to show for it. The "carefully vetted" municipal plans that formed the basis for the Supreme Court's decision proved to be illusory. Eventually, the City of New London extended an apology to Susette Kelo and her neighbors, and so did one of the Connecticut Supreme Court Justices who voted for the city. ...for the purpose of benefiting the general public and not merely for the purpose of advancing the economic interest of private parties to be given ownership or use of the property taken. However, since eminent domain is most often exercised by local and state governments, the presidential order may thus have little overall effect. imposes the same limit on state and local government exercise of eminent domain power "through the use of Federal funds." Similar bills have subsequently been put forth in the House of Representatives by Congressman Dennis Rehberg (R-Mont. ), Tom DeLay (R-Tex. ), and John Conyers (D-Mich.) with James Sensenbrenner (R-Wisc.). As some small-scale eminent domain condemnations (including notably those in the Kelo case) can be local in both decision and funding, it is unclear how much of an effect the bill would have if it passed into law. This bill has been reintroduced several times. In 2008, land use Professor Daniel R. Mandelker argued that the public backlash against Kelo is rooted in the historical deficiencies of urban renewal legislation. In particular, the article cited the failure to incorporate land use planning and a precise definition of blight in urban renewal legislation as problematic. In 2009, Professor Edward J. Lopez of San Jose State University studied passed laws and found that states with more economic freedom, greater value of new housing construction, and less racial and income inequality were more likely to have enacted stronger restrictions sooner. Prior to Kelo, eight states specifically prohibited the use of eminent domain for economic development except to eliminate blight: Arkansas, Florida, Kansas, Kentucky, Maine, New Hampshire, South Carolina and Washington. As of June 2012[update], 42 states had enacted some type of reform legislation in response to the Kelo decision. Of those states, 22 enacted laws that severely inhibited the takings allowed by the Kelo decision, while the rest enacted laws that place some limits on the power of municipalities to invoke eminent domain for economic development. The remaining eight states have not passed laws to limit the power of eminent domain for economic development. Proposition 207, the Private Property Rights Protection Act, passed in 2006. Under pre-existing California law, takings (for conveyance to a private party, as opposed to a public use that may incidentally benefit private parties) were already illegal. state and local governments from using eminent domain to acquire an owner-occupied residence [if the owner has occupied the residence for at least one year], as defined, for conveyance to a private person or business entity. In 2012, California abolished its redevelopment agencies. Private property taken by eminent domain [...] may not be conveyed to a natural person or private entity except as provided by general law passed by a three-fifths vote of the membership of each house of the Legislature. The Iowa Legislature passed a 2006 bill restricting the use of eminent domain for economic development. Gov. Tom Vilsack (D) vetoed the bill, prompting the first special session of the Iowa Legislature in more than 40 years. The veto was overridden by votes of 90–8 in the Iowa House and 41–8 in the Iowa Senate. In response to the Kelo decision, the Kansas Legislature enacted K.S.A. 26-501a and K.S.A. 26-501b and amended K.S.A. 26-501. K.S.A. 26-501a. Eminent domain; limited to public use; transfer to private entity prohibited; exception. On and after July 1, 2007: (a) Private property shall not be taken by eminent domain except for public use and private property shall not be taken without just compensation. (b) The taking of private property by eminent domain for the purpose of selling, leasing or otherwise transferring such property to any private entity is prohibited except as provided in K.S.A. 2009 Supp. 26–501b, and amendments thereto. (c) This section shall be part of and supplemental to the eminent domain procedure act. History: L. 2006, ch. 192, § 1; May 25. K.S.A. 26-501b. Eminent domain; transfer to private entity authorized, when. On and after July 1, 2007, the taking of private property by eminent domain for the purpose of selling, leasing, or otherwise transferring such property to any private entity is authorized if the taking is: (a) By the Kansas department of transportation or a municipality and the property is deemed excess real property that was taken lawfully and incidental to the acquisition of right-of-way for a public road, bridge or public improvement project including, but not limited to a public building, park, recreation facility, water supply project, wastewater and waste disposal project, storm water project and flood control and drainage project; (b) by any public utility, as defined in K.S.A. 66-104, and amendments thereto, gas gathering service, as defined in K.S.A. 55-1,101, and amendments thereto, pipe-line companies, railroads and all persons and associations of persons, whether incorporated or not, operating such agencies for public use in the conveyance of persons or property within this state, but only to the extent such property is used for the operation of facilities necessary for the provision of services; (c) by any municipality when the private property owner has acquiesced in writing to the taking; (d) by any municipality for the purpose of acquiring property which has defective or unusual conditions of title including, but not limited to, clouded or defective title or unknown ownership interests in the property; (e) by any municipality for the purpose of acquiring property which is unsafe for occupation by humans under the building codes of the jurisdiction where the structure is situated; (f) expressly authorized by the legislature on or after July 1, 2007, by enactment of law that identifies the specific tract or tracts to be taken. If the legislature authorizes eminent domain for private economic development purposes, the legislature shall consider requiring compensation of at least 200% of fair market value to property owners. (g) This section shall be part of and supplemental to the eminent domain procedure act. History: L. 2006, ch. 192, § 2; May 25. Prohibit government from taking private property for transfer to another private individual or business for purposes of economic development or increasing tax revenue. Provide that if an individual's principal residence is taken by government for public use, the individual must be paid at least 125% of property’s fair market value. Require government that takes a private property to demonstrate that the taking is for a public use; if taken to eliminate blight, require a higher standard of proof to demonstrate that the taking of that property is for a public use. Preserve existing rights of property owners. The state restricts eminent domain to public use. Minnesota Statute 117.025 Subd. 11(b) (passed in 2006) clearly states: "The public benefits of economic development, including an increase in tax base, tax revenues, employment, or general economic health, do not by themselves constitute a public use or public purpose." (1) The above provisions shall not apply to drainage and levee facilities and usage, roads and bridges for public conveyance, flood control projects with a levee component, seawalls, dams, toll roads, public airports, public ports, public harbors, public wayports, common carriers or facilities for public utilities and other entities used in the generation, transmission, storage or distribution of telephone, telecommunication, gas, carbon dioxide, electricity, water, sewer, natural gas, liquid hydrocarbons or other utility products. (2) The above provisions shall not apply where the use of eminent domain (a) removes a public nuisance; (b) removes a structure that is beyond repair or unfit for human habitation or use; (c) is used to acquire abandoned property; or (d) eliminates a direct threat to public health or safety caused by the property in its current condition. The amendment also modifies the definition of "fair market value"—used to determine the monetary compensation a property owner receives—to represent the highest value the property would be sold for on the open market, and returns seized property to the original property owner "if the property is not used within five years for the original purpose stated by the government." In New Hampshire, various libertarian activists, in response to the decision, sought to use eminent domain to seize Justice David Souter's farmhouse in Weare, New Hampshire and build a hotel (the "Lost Liberty Hotel") on the site. The proposal was not supported by the town's five-member board of selectmen, and Weare voters rejected the activists' attempt to place a proposal on the local ballot to seize Souter's farm. In 2006, the New Hampshire Legislature proposed an amendment to the state constitution providing that "no part of a person's property shall be taken by eminent domain and transferred, directly or indirectly, to another person if the taking is for the purpose of private development or other private use of the property." The amendment was overwhelmingly approved by New Hampshire voters in the November 2006 elections. Some New Hampshire commentators suggested that the state had gone too far in restricting the exercise of eminent domain in the Kelo backlash. An attempted use of eminent domain was brought before the Ohio Supreme Court in City of Norwood v. Horney. In July 2006, the Supreme Court of Ohio unanimously held in favor of the property owners, finding the seizure would violate the Constitution of Ohio. On 29 March 2006 Gov. Jim Doyle signed into law 2005 Wisconsin Act 233, which prohibits condemnation of nonblighted property for transfer to a private entity. Nonblighted property is defined by a list of conditions that may make the property a detriment to the "public health, safety, or welfare." Two days earlier the governor signed into law 2005 Wisconsin Act 208, which creates procedures designed to protect property owners including public notice and public hearing requirements. The Wisconsin law has been criticized as one having little or no real protection for property owners because it provides protection against property condemnation for economic development but does allow property condemnation under a broadly defined description of blighted. The block of land at the heart of the case, adjacent to Fort Trumbull, still stood vacant as of April 2018. Jeff Benedict wrote an account of the case in a 2009 book, Little Pink House: A True Story of Defiance and Courage. Benedict's account was adapted into a film, Little Pink House, released in 2018. ^ Kelo v. City of New London, 545 U.S. 469 (2005). ^ Kelo v. The city of New London, 268 Conn. 1, 843 A.2d 500 (Conn. 2004). ^ Kelo, 268 Conn. at 144, 843 A.2d at 587 (Zarella, J., concurring in part and dissenting in part). ^ "Amicus Briefs". The Institute for Justice. Archived from the original on 2014-07-26. Retrieved 2014-07-22. ^ Kelo, 545 U.S. at 491-92. ^ Kelo, 545 U.S. at 505 (O'Connor, J., dissenting). ^ Kelo, 545 U.S. at 494 (O'Connor, J., dissenting). ^ Kelo, 545 U.S. at 506 (Thomas, J., dissenting). ^ Kelo, 545 U.S. at 518. ^ Kelo, 545 U.S. at 521. ^ Apuzzo, Matt (June 23, 2005). "High court ruling divides New London". Newsday.com. ^ "House in CT eminent domain dispute finds new home". Associated Press. June 21, 2008. Retrieved April 15, 2018. The house once belonged to Susette Kelo, who raised a battle cry of eminent domain abuse against New London's efforts to make way for condominiums, a hotel and offices. She said Saturday that the relocated home will be a reminder of how the city reshaped the neighborhood she had to abandon. "I think it's going to make the city of New London remember what they did to the Fort Trumbull neighborhood," she said. ^ "The Kelo House (1890)". Historic Buildings of Connecticut. March 20, 2009. Retrieved 2018-04-15. The Kelo House, also known as the Little Pink House, was built in 1890 in a residential area of New London by John Bishop, a prominent local carpenter. It had various owners after Carpenter’s death in 1893 and few years later was moved to the Fort Trumbull neighborhood of New London. In the late 1980s, the Little Pink House and the house next to it were restored by the preservationist, Avner Gregory. On the market for many years, the house was not occupied until Susette Kelo moved in in 1997. When the City of New London sought to use the right of eminent domain to acquire the neighborhood for private development (which would bring in more tax money) it started a legal battle that went all the way to the Supreme Court in 2005. ^ Gershon, Eric (November 9, 2009). "Pfizer to close New London Headquarters". Hartford Courant. Pfizer Inc. will shut down its massive New London research and development headquarters and transfer most of the 1,400 people working there to Groton, the pharmaceutical giant said Monday. The move comes in the wake of Pfizer's recent merger with Wyeth, and is part of a global consolidation of the two companies' research operations. ^ Edwards, Jim (2009-11-10). "Pfizer's R&D Cuts Render Kelo v. New London Eminent Domain Case a Waste of Time". CBS Interactive Inc. Retrieved 2018-04-15 – via CBS MoneyWatch. ^ a b "After the homes are gone". San Francisco Chronicle. November 28, 2009. p. A-11. Retrieved May 19, 2018. ^ "Pfizer and Kelo v. City of New London". The Wall Street Journal. November 11, 2009. Retrieved 2010-12-05. ^ THE NATION; Case Won On Appeal (To Public), retrieved on 2009-11-13. ^ Nicole Stelle Garnett, "The Neglected Political Economy of Eminent Domain Archived September 28, 2007, at the Wayback Machine", 105 Mich. L. Rev. 101, 136; Marcilynn A. Burke, "Much Ado About Nothing: Kelo v. City Of New London, Babbit v. Sweet Home, And Other Tales From the Supreme Court[dead link]", 75 U. Cin. L. Rev. 663, 683. ^ Richard A. Posner, A Political Court, 119 Harv. L. Rev. 32, 98 (2005). ^ a b Bush, George W. (June 23, 2006). "Executive Order: Protecting the Property Rights of the American People". The White House. Retrieved July 22, 2014. ^ Daniel E. Mandelker, Kelo’s Lessons for Urban Redevelopment: History Forgotten, Wash. U. L. Rev. Slip Op. (Nov. 24, 2008). ^ a b Edward J. Lopez; Jewell, R. Todd; Campbell, Noel D. (April 1, 2009). "Pass a Law, Any Law, Fast! State Legislative Responses to the Kelo Backlash". Review of Law & Economics. Berkeley Electronic Press. 5 (1). doi:10.2202/1555-5879.1268. Archived from the original on May 7, 2009. Retrieved 2009-04-14. ^ Gideon Kanner, The Public Use Clause: Constitutional Mandate or "Hortatory Fluff"?, 33 Pepp. L. Rev. Iss. 2, 335–84 (2006). ^ Gideon Kanner, The Public Use Clause: Constitutional Mandate or "Hortatory Fluff"?, 33 Pepp. L. Rev. Iss. 336, 335–84 (2006). ^ Gideon Kanner, The Public Use Clause: Constitutional Mandate or "Hortatory Fluff"?, 33 Pepp. L. Rev. Iss. 381, 335–84 (2006). ^ NCSL: State Case Law Prohibiting Eminent Domain for Economic Development, August 2005. ^ "50 State Report Card: Tracking Eminent Domain Reform Legislation since Kelo" (PDF). Castle Coalition. August 2007. Retrieved July 22, 2014. ^ Dolan, Maura; Garrison, Jessica; York, Anthony (December 29, 2011). "California high court puts redevelopment agencies out of business". Los Angeles Times. ^ Ed Vogel (November 25, 2008). "Eminent domain limits become part of state constitution". Las Vegas Review-Journal. Retrieved 2011-07-01. ^ "Initiative Petition, Nevada Property Owners' Bill of Rights". Nevada Secretary of State. Archived from the original on 2011-10-11. Retrieved 2011-07-01. ^ Eminent domain this! Justice's farm is target, Associated Press (June 29, 2005). ^ Angry Activists Lose Fight to Evict Justice Souter, Associated Press (February 8, 2006). ^ Lawrence Friedman, The New Hampshire State Constitution (2d ed. : Oxford University Press: 2015), pp. 65-66. ^ N.H. voters opt to curb eminent domain; smaller House districts also at stake, Associated Press (November 8, 2006). ^ Elizabeth E. J. Nickerson, The Kelo Backlash: Have We Gone Too Far in Restricting the Exercise of Eminent Domain?, New Hampshire Bar Journal (Summer 2007). ^ Recent Case: Ohio Supreme Court Holds That Economic Development Cannot by Itself Satisfy the Public Use Limitation of the Ohio Constitution, 120 Harv. L. Rev. 643 (2006). ^ City of Norwood v. Horney , 853 N.E.2d 1115 (Ohio 2006). ^ A Questionable Taking in Milwaukee. ^ City set to take family's land Archived 2016-05-08 at the Wayback Machine. ^ "'Little Pink House' Hits The Big Screen, Reviving New London Eminent Domain Saga". wnpr.org. April 24, 2018. Retrieved January 10, 2019. ^ Lithwick, Dahlia (March 12, 2009). "Driven Out". Sunday Book Review. The New York Times. Retrieved 19 April 2018. ^ Dunne, Susan (April 8, 2018). "Film 'Little Pink House' Tells Eminent Domain Story From New London". Hartford Courant. Retrieved April 15, 2018. “Little Pink House” is based on the book “Little Pink House: A True Story of Defiance and Courage" by Jeff Benedict. Benedict chronicled the saga of Susette Kelo and her neighbors in the Fort Trumbull neighborhood. ... The world premiere screening of “Little Pink House” will be Sunday, April 15, at 5 p.m. at the Garde Arts Center in New London. Benedict will be there, as will Kelo and other former Fort Trumbull residents. The film opens nationally in limited release on April 20. ^ "Little Pink House". Korchula Productions. Retrieved April 15, 2018. The screenplay is adapted from Jeff Benedict’s book, Little Pink House: A True Story of Defiance and Courage. Benedict, Jeff (2009). Little Pink House: A True Story of Defiance and Courage. New York: Grand Central Pub. ISBN 978-0-446-50862-9. OCLC 225870153. Fruehwald, Edwin (2010). "A Biological Basis of Rights". Southern California Interdisciplinary Law Journal. 19: 195. SSRN 1440247. Galperin, Joshua U. (2007). "A Warning To States, Accepting this Invitation May be Hazardous to Your Health (Safety and Public Welfare): An Analysis of Post-Kelo Legislative Activity". Vermont Law Review. 31: 663. ISSN 0145-2908. Kanner, Gideon (2006). "Kelo v. New London: Bad Law, Bad Policy and Bad Judgment". The Urban Lawyer. 38: 201. ISSN 0042-0905. Levy, Robert A.; Mellor, William H. (2008). "Eminent Domain for Private Use". The Dirty Dozen: How Twelve Supreme Court Cases Radically Expanded Government and Eroded Freedom. New York: Sentinel. pp. 155–168. ISBN 978-1-59523-050-8. Ryskamp, John (2006). The Eminent Domain Revolt: Changing Perceptions in a New Constitutional Epoch. New York: Algora Publishing. ISBN 0-87586-524-0. Sandefur, Timothy (2006). "The Backlash So Far: Will Americans Get Meaningful Eminent Domain Reform?". Michigan State Law Review. 2006: 709. ISSN 1087-5468. Somin, Ilya (2015). The Grasping Hand: Kelo v. City of New London and the Limits of Eminent Domain. Chicago: University of Chicago Press. ISBN 978-0-226-25660-3. This page was last edited on 12 March 2019, at 19:04 (UTC).